It began as a solution to an annual problem in our house. It ended as a delicious example of the less well-publicized benefits of modernist cuisine (aka “molecular gastronomy” or “modern gastronomy”). The annual problem? What the heck is to be done with all of the boxes of Matzoh left over after Passover? Are we going to throw them away again? “Problem solved,” said my daughter Gwennie. At this year’s Sedar, much to her chagrin, we had not had a proper Matzoh Ball Soup. Her solution to the annual problem was for me to make her Matzoh Ball Soup using the leftover boxes of Matzoh. That raised another problem: how to make a good Matzoh Ball Soup. Matzoh Balls come in two varieties: floaters and sinkers. I have never been a fan of sinkers. Both are valid choices, at least in theory, but if I wanted a heavy ball in my soup I’d go with a Mexican Albondigas. And with that thought my broth choice was made. All that was left was sorting out those Matzoh Balls. I knew the theory: incorporating beaten egg whites into the Matzoh Balls makes them light, fluffy and airy. The issues – which, of course, I’d experienced the hard way – were not beating the egg whites enough or incorporating the solids into the egg whites too heavily. So I knew I would have to beat the egg whites nearly to the point of stiff peaks. I would also have to be very, very gentle in folding in the Matzoh meal. But I also had a trick up my sleeve: a little bit of Modernist cuisine. The ingredient in egg whites that let’s them do their magic is called “lecithin.” It is an excellent emulsifier. Of course one of the basic tools of the Modern gastronomy arsenal is soy lecithin. So, to amp up the effect of the egg whites I decided to kick up my Matzoh Balls with a teaspoon of soy lecithin. It is, ultimately, the less well-publicized side of Modernist cuisine. Instead of being about bells and whistles, showmanship and surprise it is about finding a new way to solve an old problem. 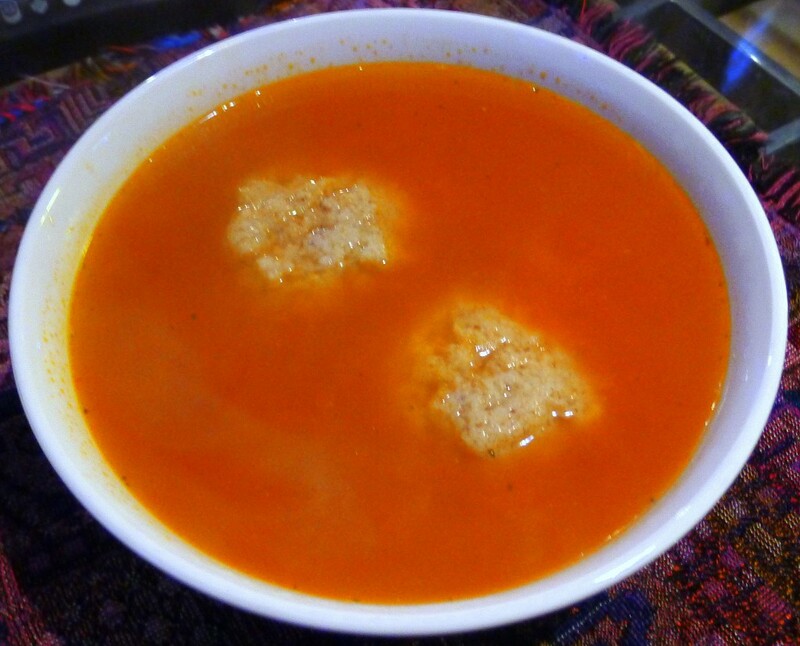 The result was a Mexican albondigas-style soup featuring pillowy, floaty Matzoh Balls that put a smile on Gwennie’s face. Roast the Vegetables for the Soup. Preheat the oven to 350° Fahrenheit. Place the tomatoes, onions and garlic on an oil a hotel sheet or roasting pan and place in the oven. Roast the vegetables until the tomatoes are blistered and the onions are beginning to brown, about half an hour. Make the Matzoh Balls. Separate the whites from the yolks of the eggs, putting the whites in the bowl of a Kitchen Aid or other similar mixer. Reserve the yolks. Beat the egg whites on high until the form soft peaks. Meanwhile beat the egg yolks and oil using a wire whisk and then combine with the whites. Combine the matzoh meal, salt and soy lecithin in a bowl and fold into the egg mixture as gently as possible using a plastic spatula. This is a job better done by two, one folding gently and the other pouring the solids in gradually. Refrigerate for half an hour. Make the Broth. In a large soup pot, sweat the leeks in the remaining oil over low heat for three minutes, until just translucent. Add in the roasted vegetables and the broth and bring to a boil over high heat. Reduce to a simmer and cook for ten minutes. Add in the lime juice and chile pepper and simmer for fifteen minutes. Cook the Matzoh Balls. Bring the broth (or stock or salted water) to a boil in a large pot. Meanwhile, cover a hotel pan with wax paper. Remove the matzoh ball material from the refrigerator. Working with moist hands (have a bowl of water handy to refresh), take a heaping tablespoon of the matzoh ball material and form into a ball. Gently place the balls in the pot of boiling broth. Reduce the heat and simmer, uncovered for fifteen minutes. Plate the Dish. Ladle the Chicken-Tomato Broth into soup bowls. Float two Matzoh balls in each bowl and garnish with cilantro leaves if desired. Fascinating. I have lecithin laying around (in a molecular kit). I might have to try it. You know, I have never even separated the eggs. Somehow my matzo balls always end up floating. Maybe because I make them smaller?? Anyway the secret for me is caramelizing onions in schmaltz. Matzo balls just don’t taste the same without it! I love caramelizing the onions in schmaltz. You can’t go wrong that way….